The Martinez City Hall is located at 525 Henrietta Street, Martinez, CA 94553; phone: 925-372-3500. 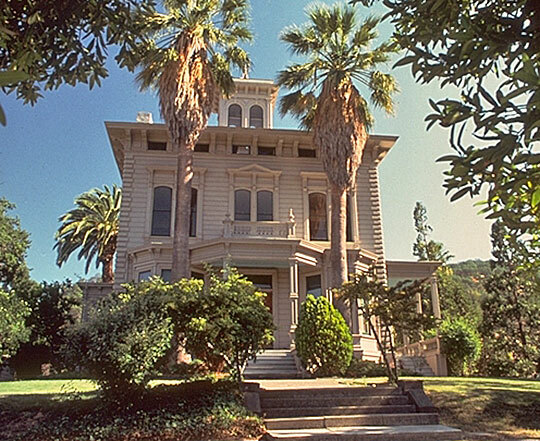 Photo: John Muir National Historic Site, ca. 1883, 4202 Alhambra Avenue, Martinez, CA. Listed on the National Register of Historic Places in 1955 National Park Service, not dated, photographer: not listed, [cc0-by-1.0 (creativecommons.org/publicdomain/zero/1.0/deed.en], via Wikimedia Commons, accessed July, 2013. The first settlement of the region contingent to the City of Martinez, the county seat of Contra Costa County, was made about 1823, more than 20 years before gold was discovered in California. Before the eyes of the East, and in fact the entire world, turned toward the Golden West, Ignacio Martinez and Francisco Castro applied for and received grants to vast tracts of land, the latter receiving what was known as the San Pablo Rancho, and Martinez receiving the Pinole grant. The nearest neighbors were the Peraltas and the Castros of San Antonio and San Lorenzo. Martinez and Castro erected adobe residences, pretentious ones for that period, built barns and planted trees and vines. They became the first fruit and grape growers in Contra Costa County. Other families followed, but the haciendas of these two grandees were the hub of the life and the activity of this section. In 1832 William Welch, a Scotchman, secured title to the tract of land known as the Welch (or Las Juntas) Rancho, on which a portion of the City of Martinez now stands. From that time up to the discovery of gold at Sutter's mill there was little development of this region. In 1849 Colonel William M. Smith, acting as agent for the Martinez family, from whom the city derives its name, decided upon founding a town. In furtherance of this project he employed Thomas A. Brown, who later became a superior judge, to survey and lay out 120 acres on the westerly side of El Hambre Creek. This was promptly done, and the tract being subdivided, the lots and blocks were quickly sold and the building of houses and stores commenced. The first building erected in the town was the home of Doctor Leffler, built by Nicholas Hunsaker, and the second by Judge Brown, in which he, with his brother Warren and Napoleon B. Smith, opened the first trading post in the county. In 1850-1851 the first addition to the town was surveyed by Judge Brown under instructions from the owners of Welch Rancho, El Hambre Creek being the line which divides the original survey (Pinole) from the additional survey (Welch, or Las Juntas). This tract consisted of between 500 and 600 acres, and was also laid out in blocks and lots. The first buildings erected were the houses of Wise, Douglas, Lawless, McMahon, Doctor Bolton, and the Contra Costa News office. The Douglas House was used as the first office of the county clerk. F. J. Hulamnski, editor, The History of Contra Costa County California, The Elms Publishing Co., Inc., Berkeley, CA, 1917.